EXCLUSIVE: £30 off when you spend £100! 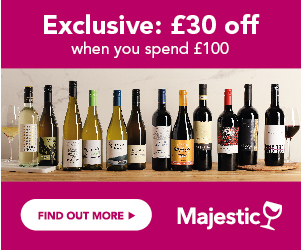 Those lovely people over at Majestic Wine have a treat for all new customers, in the shape of a £30 voucher! That's right, simply spend £100 or more on any wine, beer or spirits (easily done when the selection is this good), and apply your discount code at the online checkout. Or just pop in to your local store, fill your trolley, and show your voucher to a member of staff at the till. Simply reveal your voucher code above and start exploring their fantastic range! Please be aware discounts and promotional offers at Majestic Wine are only applicable when you buy 6 or more bottles. Majestic specialises in selling wine in local stores and online. Order from their large range of wines, some of them you won’t find in supermarkets. They offer wine but also Champagne, sparkling, spirits, beers and soft drinks. The brand is a true success story. From the opening of its first shop in North London in 1980, it has now more than 200 stores all around the UK. It received many prestigious awards such as the ‘Best National Wine Merchant’ by Decanter for five consecutive years. The minimum purchase at Majestic is now down to 1 bottle! Mix & match 6 bottles or more to get at least 10% off and up to 33% off your order.